What people are saying about Merv Moriarty, his books and innovative colour tools. past Director of the National Portrait Gallery and the National Museum of Australia. knowledge so generously with us! I cherish every morsel! I wish i knew this stuff years and years ago! ...” His Excellency Michael Bryce AM AE. many...A valuable and alternative voice in the Australian art education scene.” Sasha Grishin art critic and author. I hold Mervyn Moriarty personally responsible for any artistic ability I have today and am eternally grateful. When life seemed to turn away from the artistic goals I held as a child, down came Merv from the skies with his Eastaus Flying Art School. In 1972 I was a young mother in a remote area of Queensland. I’d grown up in an even more remote spot and was happy and at home in the bush, but like many young mothers I was struggling to preserve some sense of identity among teething woes, infant tantrums, so Merv’s two-day seminars seemed heaven-sent. They provided two days of sacred me time. Although a city boy born and bred, Merv seemed entirely at home in the bush environment and was accepted with open arms. Art and country are inextricably intertwined, and he wove them together in his own inimitable style. Congratulations Merv on a lifetime of sharing and teaching with generations of aspiring artists, a unique contribution to our culture. Flying Arts is a wonderful resource founded by Merv that continues today. It is unique in the world and is parallel with the Flying Doctor. Merv recognised the need for country folk to have access to good art tutoring and when he learnt to fly he used to visit regional centres to bring art tutoring to people in isolated communities. I have fond memories of his workshops when everyone would get together and show what we had done since his last visit. We were all anxious to hear his golden words of wisdom and hope of improvement since the last visit. Merv introduced us to many things such as plein air painting, tonal values and of course colour (his favourite). His encouragement helped me a great deal and he organised a solo exhibition for me in Brisbane at the then Red Hill Gallery. This was my first foray into showing my work in the 'big smoke'. I was very anxious about the experience but since then I have gone from strength to strength achieving many awards and represented in State and private collections in Australia and overseas. I have also had formal art training receiving a Diploma in Fine Art, a Graduate Diploma Museum Curatorship and a PhD. I have held over 50 solo shows and received more than 60 art awards. I also have my own boutique gallery in Townsville: Sylvia Ditchburn Fine Art. My recollections of Mervyn Moriarty are scant but powerful. Although I was not a student of his, I was a member of the Dalby art community in the 1970s when Mervyn flew in. Therefore, he said I was welcome to bring my artwork for appraisal when he visited. I was grateful for his advice and time, which were freely given. Both my mother, Enid Ross, in her seventies, and my daughter Kathryn Brimblecombe-Fox, who was eleven or twelve years old at the time, went to Merv’s classes and both benefited greatly from his teaching. Later, my mother gave me a series of booklets on art practices, which Mervyn put together for his students. They are entitled EASTAUS and are still in my possession. Mervyn was a very generous man with his spirit, enthusiasm and talent. He enlivened the artists in Dalby not only with the skills and expertise he shared but with his philosophical and intellectual approach to art and life. There was a blossoming of a deeper understanding and appreciation of art and being an artist was Mervyn started flying into our town. Not only did he improve art practice but he broadened horizons; introduced new ideas; gave people the confidence to be different. He freed us all up and enhanced our lives considerably. He made a difference in Dalby and I am sure he did everywhere he went. I look forward to the Merv Moriarty retrospective exhibition as a rich and meaningful unfolding of his vision, to track his creative journey but also for the way his work will illuminate the underlying abstraction of the visual world for a new generation of art students. I believe that Merv Moriarty has been responsible for bringing the principles and practice of visual art to his students throughout Queensland and beyond. I hope and trust that this insight continues to reverberate through the work of his students, and in many instances their teaching. Merv Moriarty has spent a lifetime committed to art and its teaching. Born in 1937 in northern NSW Moriarty's work is represented in prominent Australian and international collections including the Queensland and New South Wales Art Galleries. Moriarty has been a major prize winner and finalist and his career has spanned traditional realism through to abstract art and powerful figurative works. This figurative style, which focuses on the human body, has led to an ever-growing imposing and even confrontational body of work which continues to inspire comment and recognition. Moriarty has been quoted as saying: "All humanity must embrace the feminine side. Women possess great courage, it's a great attribute." While a great Australian artist in his own right, Moriarty's true life calling has been the teaching of art. An anti-elitist philosophy; sense of adventure and inherent understanding of this calling led Moriarty to found the Flying Art School, first known as EastAus Art School – after gaining an unrestricted pilots licence in the early 1970s. Moriarty learnt to fly in order to found the school, which led him to remote areas in Queensland and Northern NSW teaching art to many people who were starved of culture and often even company. Flying Arts as it is now known continues to this day, a legacy of Moriarty's vision and humanity. After a number of years running the Flying Art School Moriarty moved on to head private art schools in Brisbane and Melbourne and is today considered by many as one of the best art educators in Australia. Over the past decade, Moriarty has been inspired to put all this knowledge - his life's work - into two art texts, one on colour and the other on draftsmanship. The text on draftsmanship, The Eyes Mind - the artist and the draftsman has now been self-published and handbound by Moriarty and is considered a work of art in itself. It reinforces Moriarty's belief that for any true meaning to emerge from modern art, contemporary artists need a clear grasp of form and structure, which can only be taught through seeing the subject and the world from a different perspective. In 2011 COLOUR – the definitive guide was launched at the National Library of Australia, by Andrew Sayers AO, now director National Museum of Australia. Merv is now working on COLOUR guide - the workshop notes. 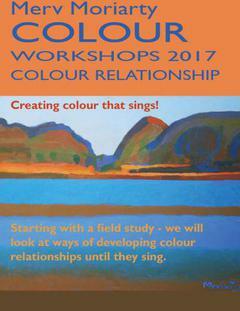 This will cover a five day workshop including theory and exercises. His colour principles, researched with thousands of students and outlined in the book, have far reaching application – for industry and for art and design – and consequences. Merv Moriarty says we need to balance logical and holistic thinking, in the Arts, as in all human endeavours. "The pollution of the planet today is the pollution of the human mind." The challenge says Merv Moriarty is to present this information, this discovery about the way colour works and its aesthetic implications, in an accessible way to pass on this knowledge to students from primary to college, from amateur to professional artists and designers. As well as write, produce books and art and design colour tools, Moriarty continues to teach and paint. He lives on the Far South Coast of NSW with his partner, eminent Australian artist, environmentalist and designer Prue Acton OBE. Merv and Prue are directors of Moriarty Colour Pty. Ltd. which they have formed expressly to develop and find support the Moriarty COLOUR Guide a new colour space based on the principles of outlined in Mervs books and which have lead to developing the Three-section COLOUR Mixing Plotter and the HTP COLOUR Chart. Merv and Prue see a place for the Moriarty COLOUR guide in all art and design institutions, as well as throughout the colour and design industry. The new edition will be the last edition before the system is pateted for digital application, an exciitng next stage of development. Hear more about Merv Moriarty's life story as he tells it to the ABC's Richard Fidler on the Conversations program at www.abc.net.au/local/stories/2009/02/27/2503244.htm. Merv Moriarty is the author of The Eye’s Mind – the artist and the draftsman and COLOUR – the definitive guide and creator of Moriarty COLOUR Mixing System.